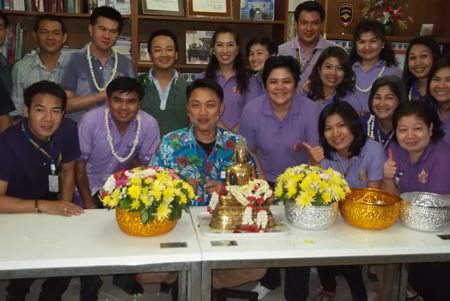 The Chonburi Immigration Office staged a traditional Songkran activity a day after the Songkran madness ended. Superintendent Pol. Col. Prapansak Prasarnsuk hosted the April 20 “rod nam dum hua” ceremony at the Jomtien Beach office. Relatives and family members of immigration officials were invited to join the ceremony to poor scented water into the palms of the senior officers while asking for blessings. Chonburi Immigration officials and staff gathered to soak the palms and pay respect to Prapansak, who doled out his blessings. Relatives and family members of immigration officials were invited to join the “rod nam dum hua” ceremony at the Chonburi Immigration Office in Jomtien. Officials and staff poor scented water into the palms of Superintendent Pol. Col. Prapansak Prasarnsuk.